I swear I keep seeing the title read French Fries. I love French Fries. Nice pipes too. Italian pipes have their own very different school of design. I grabbed my one Canadian shaped pipe off the rack today and noticed that it's stamped Canadian on the top and Algerian Briar Made in France on the bottom. The only marking on the stem is a C inside a circle. I think I paid around $15 at a junktique shop for it. That being said, I haven't been able to identify the brand but it has been a good smoker. German are too proud of their pipes for my taste generally. Being half German half Italian, I would love to understand what exactly you're trying to express with this. don't mistake me for being offended, I'm just curious what you're referring to. I like that pipe. For $15 bucks I'd have bought that one too. I just wish I could figure out the maker/brand. I've researched it on pipepedia and pipephil to no avail. I'm thinking it may have been made as a basket pipe for a pipe shop. What you see in the photos was after I had removed the finish. The grain isn't perfect but I didn't find any pits or fills and its drilled closed enough that it easily passes a pipe cleaner. I don't know what it looked like before you put in some elbow grease. But it's a beauty now. Great find at $15. It looked like someone kept it in their tool box with greasy tools they never bothered cleaning and what finish it had seemed to be flaking off. 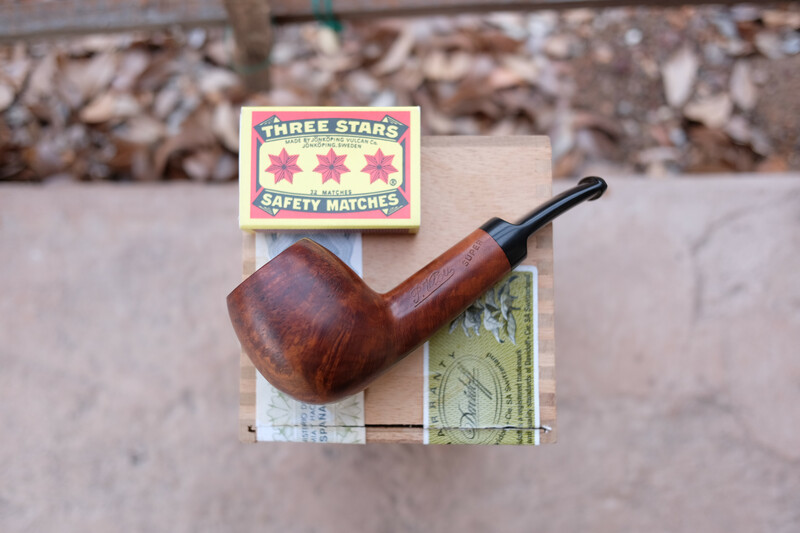 By proud I meant German pipes in my experience in the estate offerings at smokingpipes are what I consider very expensive, and generally in the hundreds of dollars price range. Its just an expression I've grown up with when something is up for sale at a price generally presumed high for a certain item is all and generally when I get the email on Thursday of the new estates available the German pipes, as a whole are substantially more expensive than the other categories of pipes, hence the German pipes are very proud of their pipes. We need to remember the birth place of the Briar pipe. Saint Claude France. For some strange reason it seems many kind of turn away from the French pipes--why i do not know. Because of these prices, my 2nd pipe was a churchwarden commissioned to a German artisan pipe maker. It simply didn't make sense to just buy a pipe in a shop. So german pipe smokers tend to have either expensive pipes or custom made artisan pipes (which can be expensive as well). was permanent, other companies had established themselves as market leaders, causing many of those french pipe makers to be forced out of business. Now I have no evidence for those words, but it does seem plausible. One could be smoking their LePipe while driving their LeCar. That car reminds me of our American AMC products. No--it doesn't stand for American Motors Company.---The letters AMC have another meaning. When you are at a gathering, and someone points out the AMC car parked with the other cars--someone asks--who's car is that?